Costa Rica is blessed with stunning scenery and an abundance of rainforests and beaches. It’s not often that you get the two merging together but here in Costa Rica it happens more than you would think, in some areas the rainforest grows down the hillside right up to the beach – it’s easy to spend a morning hiking and exploring the wildlife in the forest and then relax on a sandy beach for the afternoon – sheer bliss. If the rainforest you are visiting doesn’t actually meet the beach, it won’t be very far away and you could still experience both in the same day, maximising on your time in Costa Rica. 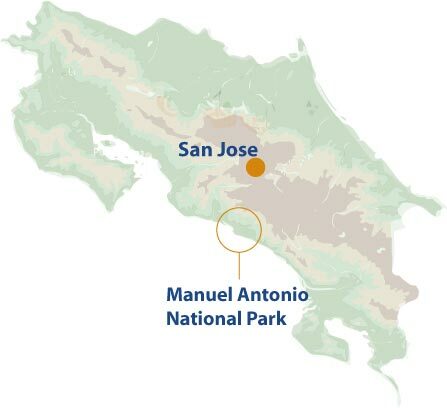 This is one of Costa Rica’s smallest national parks. Due to it’s location and beauty it is also one of the most popular and well worth a visit. This is one of the prime spots where you find both rainforest and beach in the same location – this doesn’t happen everywhere and it makes Manuel Antonio National Park one of the prime spots for wildlife watching one minute, and relaxing on a sunny beach the next. It’s easy to make the most of your holiday, see different areas experience different types of landscape in the same location. Tortuguero is Spanish for turtle and as the name would suggest this is one of the best places to see turtles during nesting and hatching seasons. But it’s not just turtles that you can see in this national park. This is a unique example of rainforest, and beach coming together – there is a whole network of waterways and lagoons surrounded on all sides by dense rainforest, full of wildlife and plants waiting to be explored. This wild jungle surrounding the tangled waterways encroaches the edges of the sandy beaches where the turtles lay their precious eggs in the soft sands above the tideline. This area is home to some pristine, jungle backed beaches. A little more off the beaten track than some of the other parks and reserves in Costa Rica gives this area a more remote, deserted feel. With rainforest, mangroves, lowland forest, beach, ocean and coral reefs amongst the habitats here it is home to a plethora of flora and fauna. The rainforest is home to toucans, woodpeckers, eagles, and tapirs while the waters are inhabited by dolphins, manatees, caimans, green and leatherback turtles. The coral reef has it’s own inhabitants to look after, the beautiful brightly coloured fish, sea urchins and anemones along with oysters, shrimps, sea cucumbers and sponges.